If you’re new to content marketing and SEO, or if you’re an old pro, uncovering keyword volume is essential to understanding what topics you should be covering. A keyword can be a word or a phrase that is typed into a search engine. Content marketers and SEOs target specific keywords in the content they create in hopes that search engines will rank their content highly. The higher a piece of content ranks for a keyword, the more visibility and potential clicks it will get. A keyword isn’t always a single word. In fact, the majority of keywords targeted by marketers are more than one word. Why? Let’s explore. Keyword volume is the number of searches for a specific keyword over a specific period of time (usually per month), in a specific location, and in a specific language. Very generic keywords usually have high search volumes. 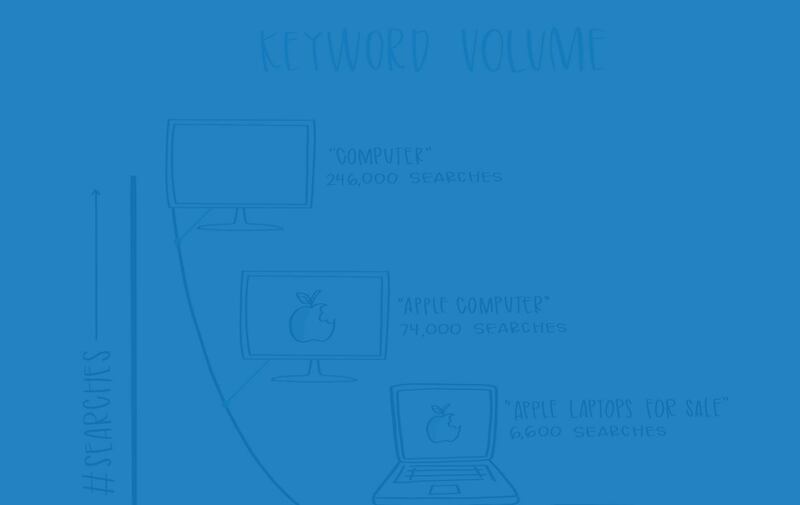 In the sketch above, the simple keyword “computer” has a search volume of 246,000 searches per month. The more specific a keyword gets, the lower the keyword volume becomes – in most cases. Above, as the keywords get more and more specific, the number of searches people do for that term decreases. Keywords fall into three categories depending on their length and specificity: short, medium, and long tail keywords. 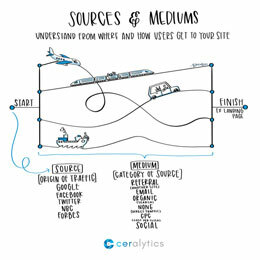 We wrote about these categories a little while ago – it’s a good read if you haven’t checked it out. Why is keyword volume important? What would happen if you threw a party and nobody came? It wouldn’t be all that much fun. Well, the same goes for content. What happens if you create a piece of content about a topic that no one cares about? Keyword volume gives you a good indicator of how popular a certain topic or keyword is. The higher the volume, the more popular it is. 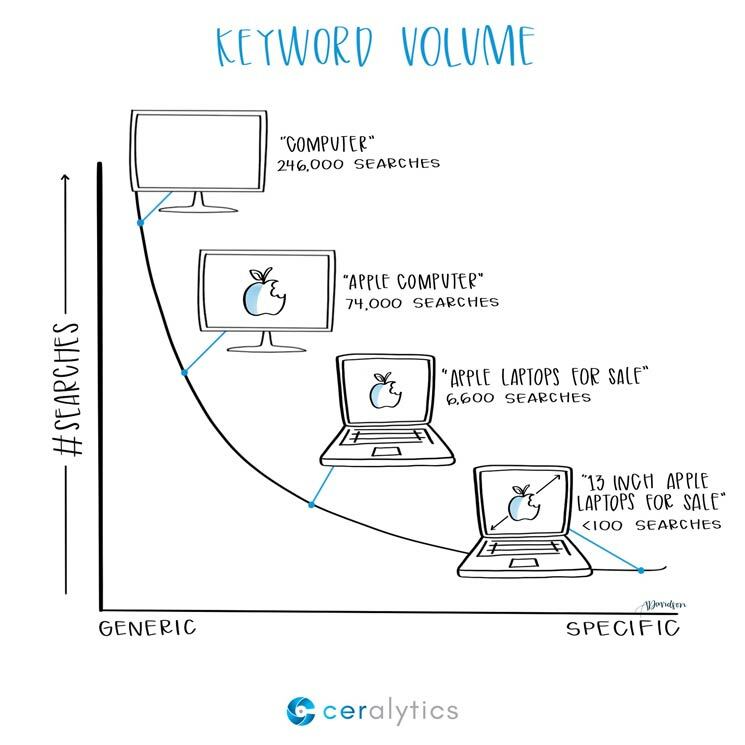 But keyword volume alone is just one thing to take into consideration. The higher the volume, the better chance that more people are competing to rank for that keyword. That increased competition could keep your content from ever breaking the top 100 search results for a high volume, generic keyword. But even if you could cut through the difficulty, the other thing to keep in mind is whether your content is solving someone’s problem. If a person searches for “computer” what kind of thing are they interested in? It could be anything – wanting to buy a computer, learn about the history of computers, getting the definition of what a computer is, etc. The goal of your content should be to solve someone’s actual problem. If the keyword you pick doesn’t help you understand the user’s problem, it may not be worth pursuing. How is keyword volume calculated? Some SEO tools combine this data with historical data they have to get even more accurate keyword volumes. In our experience, it seems that search engines under-report search volumes, so if you see a search volume of 10 for a keyword, it may actually be getting well above that on certain months. Look at the keywords you’re targeting in your own marketing. Do they have much volume? Are they specific enough that if someone searched for that term, and found your content, that the content would alleviate their pain point? If not, you may want to target better keywords that have a good combination of keyword volume, low difficulty, and relevance to a specific problem.